Ever wonder how you’d draw blood from an orangutan or trim an elephant’s toenails? You can’t force them and it’s dangerous to sedate them, so how is it done? Well, it’s called cooperative care and you have to train them for it. Progressive zoos and aquariums around the world have taught animals how to be active participants in their own husbandry and veterinary care. Which proves that you can train an animal to accept something unpleasant, or even painful, if you take the time to teach them. And, if we can do it with exotics, we can do it with our domestic dogs and cats. 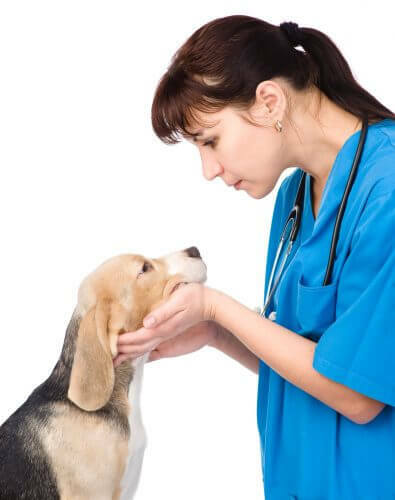 Without exception, every dog will need vet care and some form of grooming. This can be a major stressor for both dogs and their owners. After working in the veterinary field for 23 years I can attest, most dogs HATE going to the vet! Because its stressful and uncomfortable, even painful at times. What if I told you there was a way to make it less stressful and maybe even enjoyable for our dogs? Health care can be cooperative, not forced, and I’ll show you how! First, we need to teach our dogs some basic behaviors. We’ll start with a chin rest. We teach the dog to rest his chin on something. The chin rest will be our dog’s way of saying “I’m ready, go ahead with what you’re doing”. Next, with the dog in a chin rest, we start to mimic husbandry procedures, such as an ear cleaning, by starting with a simple touch of the ear and giving a treat. Then, touch with a Q-tip and give a treat, lift the ear flap and give a treat, working all the way up to an actual ear cleaning. If, at any time, the dog feels uncomfortable, he is allowed lift his chin and we take a break. This training can be applied to any husbandry procedure – oral exams, eye exams, injections and blood draws, nail trims, brushing. Every time you practice these procedures without force or pain you gain your dog’s trust. Think of it as making a deposit into a behavioral bank account. The more deposits you make, the easier it is to make a withdraw when the time comes for that actual blood draw!